We invite you to attend our fourth annual Touch-a-Truck® fundraiser on Saturday, May 4 presented by Johnson Lexus. Here are five reasons you should plan to attend! Touch a truck, feed a child. 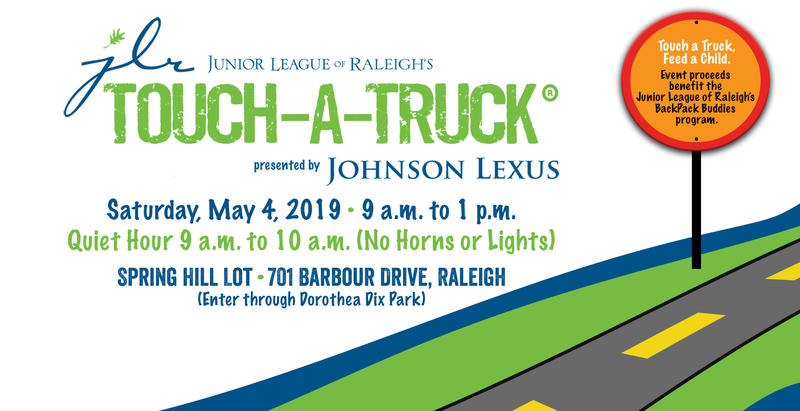 Event proceeds benefit JLR’s BackPack Buddies program, which feeds more than 500 children from food-insecure families in Wake County. BackPack Buddies provides food to students throughout the school year at area public schools, StepUp Ministry and AventWest Children’s Mentoring and into the summer through our partnership with the YMCA of the Triangle’s Camp High Hopes. Get up close to emergency vehicles and more. Attendees have a unique opportunity to explore trucks and vehicles up close, including a fire truck, city bus, SWAT armored vehicle, ambulance and dump truck, while speaking with vehicle operators, like police officers, firefighters and city bus drivers, to learn more about their roles. Fun for the whole family. Activities like an enormous monster truck bounce house, woodworking and STEM crafts hosted by Kids Learning Carpentry and free face painting courtesy of Coldwell Banker Howard Perry and Walston will keep the whole family busy. And a quiet hour from 9 a.m. to 10 a.m. is perfect for those who prefer activities without the noise and distractions of horns, sirens and flashing lights. May the fourth be with you. Don’t miss a special appearance by “Star Wars” characters from 10 a.m. to 11 a.m., thanks to Party Princess Productions. Feast on local favorites. All that activity calls for snack time! Local food truck favorites like The Pit Authentic Barbeque, Buoy Bowls, Burger 21 and Kona Ice will be at the event to keep everyone refreshed throughout the day. Discounted ticket and raffle packages are now available online. Admission is free for children under age one. We hope to you see you there!